Opera singer Placido Domingo was part of the latest group of legendary performers bestowed with the prestigious Kennedy Center honors. CBS News Entertainment Correspondent Mark McEwen had a chance to talk with him about the rare distinction. "To have this recognition is really terrific," said Domingo, who is widely recognized as one of the greatest tenors of the modern era. He added that he's an admirer of the other honorees, Chuck Berry, Mikhail Baryshnikov, Clint Eastwood and Angela Lansbury. "I mean, it's phenomenal...it's a great day." The handsome Domingo is credited with using his golden voice to bring opera music to the masses. In 1997, Domingo performed in concert with two other world class tenors, Luciano Pavarotti and Jose Carreras, an event which attracted many people to opera who weren't previously opera fans. "There are two kinds of people that don't go to the opera. People that cannot afford to go to the opera, because it's not exactly inexpensive. And the other people, which is the people that...don't care. And they haven't been exposed to it. And they don't know it. And so simply, they don't go. And these people, we have been able to win," said Domingo. Domingo has 115 roles in his repertory. McEwen asked him if there is one role among them that's his favorite. 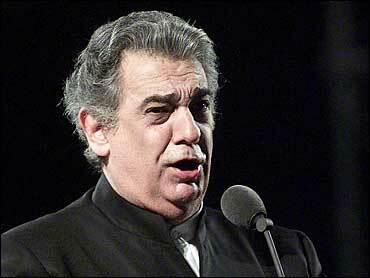 "Let's say that the signature role that I have done most is Otello. Of course, Otello gives you the possibility of combining the singing with the acting. And it is a monumental role. So what's wrong to say if my best role has been the greatest of roles? I'm very happy and proud," he said. After one performance of Otello, the audience gave Domingo 101 curtain calls and an 80-minute standing ovation. That's the world record for the longest standing ovation ever. "You don't know anymore what to do, you know? You go out, and the public is still there. And you say, 'Well, what are we doing?' And you come out again, and you take a little longer to come next time. And you say, 'I hope they go.' No, they continue. But it was a great, great experience, very thrilling." Domingo was born in Spain in 1941 and grew up in Mexico. His parents were singers of light Spanish opera, called zarzuela. Domingo says his first love growing up wasn't singing, but football. As a child he studied piano and conducting, until his gift for singing was discovered. He's made over 100 recordings and has won eight Grammies. His telecast of Tosca was seen by one billion people. Currently Domingo is artistic director of both the Washington and Los Angeles Operas. "When I am singing, I try to imitate the most beautiful instrument that I know on earth, which is the cello," said Domingo. According to Domingo, tenors are different from baritones. "I think baritones, they can lead a normal life. They just don't have to worry. They have the normal voice. Let's say te man, more or less, has to have a voice like this when speaking. And tenors, we have to go higher. And we live dangerously."